Brando is notorious for its collection of bizarre USB gadgets, and one in particular is for consumers who don’t mind a little surf on their computer turf—meet the USB Aquarium with Alarm Clock and Thermometer! 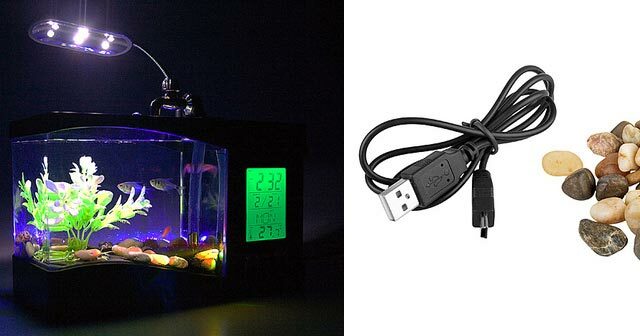 It is probably safe to say that when inventor Ajay Bhatt was working out the specifics for the USB interface, he probably never dreamed that someone with an out of the box imagination would use it to hook a fully functioning fish tank to one’s computer. However, Bhatt’s invention is so flexible that this is exactly what is happening! USB buses not only connect a device to a host controller (most often a computer), it also provides its own power. And, because of this great attribute, a USB gadget is a dime a dozen these days. While some may call the USB aquarium a little odd, one must also admit that it is rather imaginative! It is safe to say that most people do not want a 239 X 99 X 210mm vat of water, not only sitting next to, but actually connected to, their computer. But for those who are not faint of heart (or afraid of electrocution) this may be just the piece of kitsch that will make their cubicle a home away from home. Let us not sell this fantastic USB gadget short, however! It serves many functions, and they are all powered by the 5 volt line connected to the USB port. At a mere $40 dollars, anyone can have a fully functioning USB fish aquarium, with a built in recirculation pump. In addition, they will also receive an alarm clock that sports a built-in LCD display. Consumers never need to worry whether to take that sweater off or leave it on again because of the aquarium thermometer that keeps constant vigilance over sudden office climate changes. A built-in light with 6 LEDs help to bring the novelty of the aquarium to life. Would you dare put your fishes, turtles or other aquatic life in this aquarium? Tell us what you love and hate about this USB gadgets! This entry was posted in Articles, USB Gadgets, USB Technology and tagged USB Aquarium, USB Aquarium with Alarm Clock, USB Aquarium with Thermometer, USB Desktop Aquarium, USB fish aquarium, USB gadget, USB Mini Desktop Aquarium, USB Powered Mini Aquarium. Bookmark the permalink.